Docker is definitely not the new kid on the block, but it has emerged as a first class citizen with spiralling cloud-native applications. So whether you are a seasoned developer or a budding devops engineer, you would often find yourself working with Docker CLI as you work with containers. This is my take on creating a Docker cheatsheet which is nothing more than a quick compilation of the most frequently used docker commands that I fool around with. The second command using awk to grab just the container ids for all the istio based containers. This list can further be passed to other docker commands as a lot of commands need container id to work with. docker ps -a --filter "status=running"
The difference between Killing and Stopping containers is that Kill sends a SIGKILL signal as opposed to SIGTERM sent by Stop and does not wait for the container to shutdown gracefully. By default Stop gives 10 seconds time to container to shutdown gracefully, however that time is configurable. Always prefer stop over kill. When you restart a docker container that has been stopped, you cannot override the default command. The docker run command actually first creates a container from the given image and then runs it. 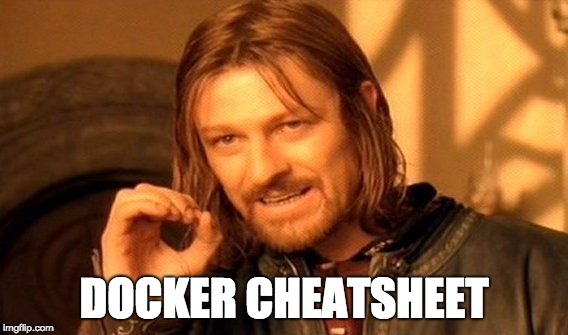 So in a sense, docker run equals docker create and docker start with a few minor gotchas. What it will do is, override any default command that alpine image had ( if it had one ) and run the echo hi there command instead. Also note that any arguments to docker run override the arguments passed to CMD in Dockerfile. This will work only if the command is supported by the running container, for example running python on an alpine image without installing python will not work. This is absolutely essential sometimes to get inside a running container and understand whats going on – shell to the rescue. Mostly used for debugging on local/dev environments. docker build -t agrajm/hello-world:latest . Tagging an image becomes essential as you build and deploy custom images for you application, you must tag them with release numbers to version the images so that one can pull different versions of your application as and when required. As always when in doubt please refer to docker official docs for best practices and details about supported arguments to these commands.